Have you ever seen it or used it? Seems like a strange application process compared to your typical clay bar and wax procedure. I copy/pasted the install procedure from my email so I'm sorry for the formatting to the web. 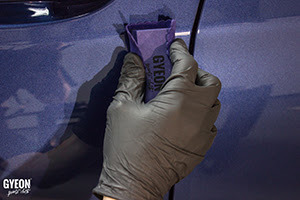 Step one is always a thorough degreasing or cleaning of the paint with GYEON quartz Q2 Prep. 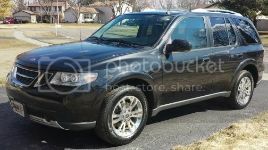 Prep is going to break down and remove any leftover polishing oils or detergents from the prior detailing process. If you’ve used an exceptionally oily polish, then a stronger degreasing agent may be needed to completely remove the oils. This is a very important step, as we want a clear and direct bond with the base layer of Q2 Mohs for maximum performance and ease of application. I like to go on fairly heavy with Q2 Prep so we really allow the product to work. 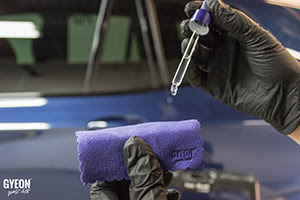 Equally as important to the amount of product, is using a brand new, plush, and highly absorbent microfiber towel like the GYEON Q2 SoftWipe or PolishWipe. 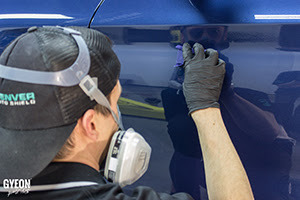 We want to make sure that we are absorbing the material that Prep removes and evacuating it from the paint. You may need multiple towels to ensure that you are not working with an overly soiled towel and transferring unwanted material from one panel to another. Once Q2 Prep is complete, it is time to apply the Q2 Mohs. 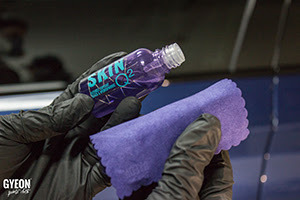 Q2 Mohs is a very easy product to work with, and my favorite in the GYEON line. It should be applied in 2 thick layers, with 1 hours’ time in between each layer. Work in a controlled environment, out of direct sunlight. 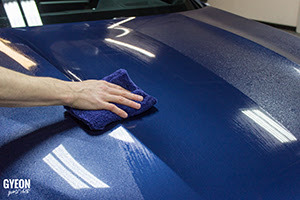 The initial bond with Q2 Mohs to the paint happens within 3-5 seconds of application. So depending on environment, the sweet spot for removal will be between 30 seconds to just over one minute. With any coating, the higher the humidity the faster the product will “flash”. So pay attention to this and find the perfect removal time for your install environment. You can use the dropper already installed in the Q2 Mohs bottle, or remove it and use the pipette. Both work equally as well and it is totally personal preference. Apply 3-4 drops of Q2 Mohs to the included Suede Applicator wrapped over the Foam Applicator Block. When using the pre-installed bottle dropper, I like to just run 2 lines of Q2 Mohs long ways across the applicator. I like to apply Q2 Mohs to an area about shoulder width wide. This keeps the install area directly in front of me, and I am making sure not to “creep” the outer edges of the area and grow it. Work the product over the paint in a cross hatch pattern making sure to overlap strokes by 50%. This will ensure an even and controlled installation. Wait 30 seconds to a minute and then wipe off the excess product. Again, we should be using brand new and highly absorbent microfiber towels. The removal of Q2 Mohs is very easy and smooth. We are going to apply 2 Layers of Q2 Mohs. Make sure to wait at least 1 hour before installing the second layer. After Q2 Mohs is applied, we need to wait at least 4 hours before applying Q2 SKIN. You do not need to wipe the surface with Q2 Prep between Q2 Mohs and Q2 SKIN. Once you’ve waited the minimum 4 hours after Q2 Mohs, we can go on to applying Q2 SKIN. Q2 SKIN will feel different in terms of application than Q2 Mohs. Use Q2 SKIN moderately. If you go on too heavy with Q2 SKIN it can be a little difficult to remove. When you find the perfect mid-level of product to apply to a shoulder width area it almost disappears itself. As you work Q2 SKIN in to the panel you will feel it get EXTREMELY Slick. It is a lot of fun to install. Work the same size areas as Q2 Mohs. However Q2 SKIN can be wiped off and removed almost immediately after it has been applied. So as long as it takes you to perform a few cross hatch patterns, put down your applicator, and get to your removal towel is fine. This should be roughly 20 seconds or so. 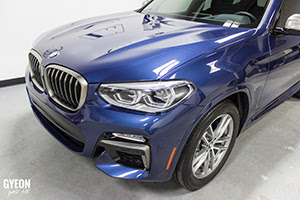 Once cured, the Q2 SYNCRO kit delivers a very unique and intense gloss. The water behavior at your first wash will be wild, so have FUN!